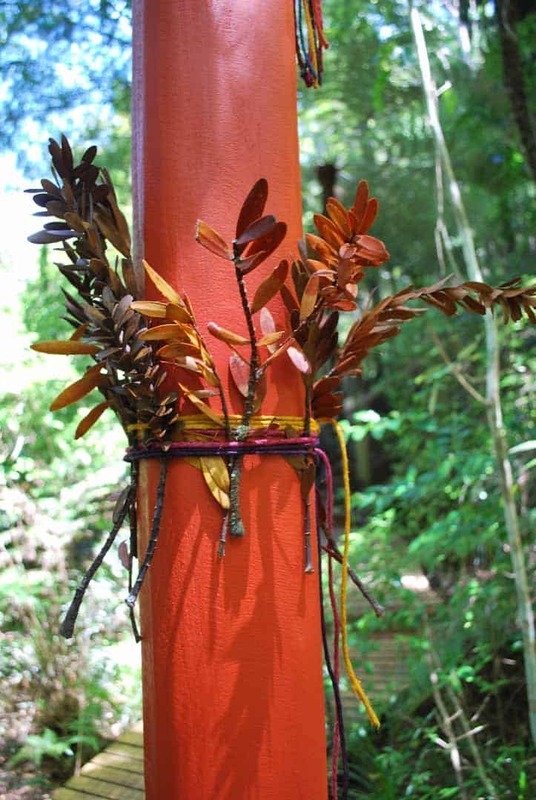 The Tree Which Moves Some To Tears Of Joy Is In The Eyes Of Others Only A Green Thing That Stands In The Way draws on the ancient tradition of tree worship (dendrolatry) which has played an important part in many of the world’s mythologies and religions. 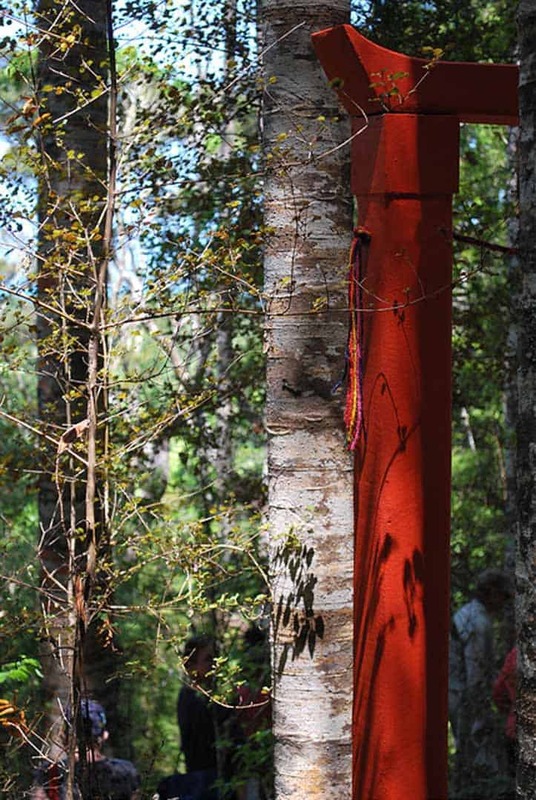 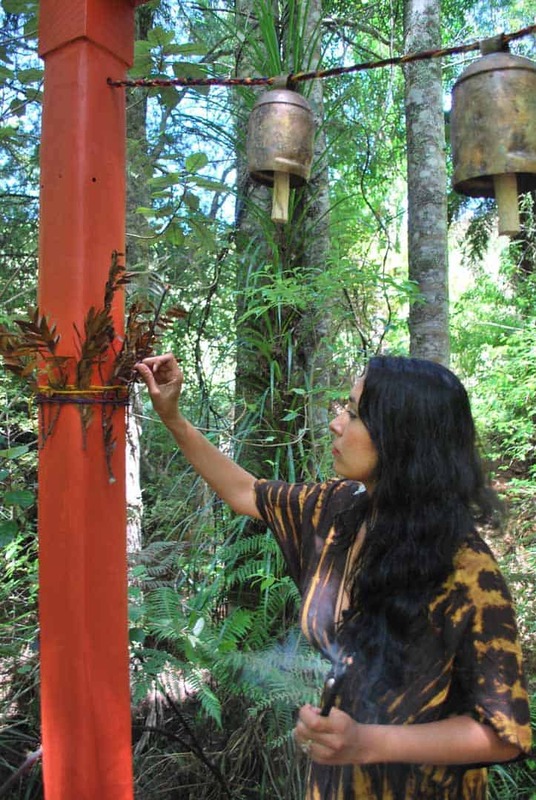 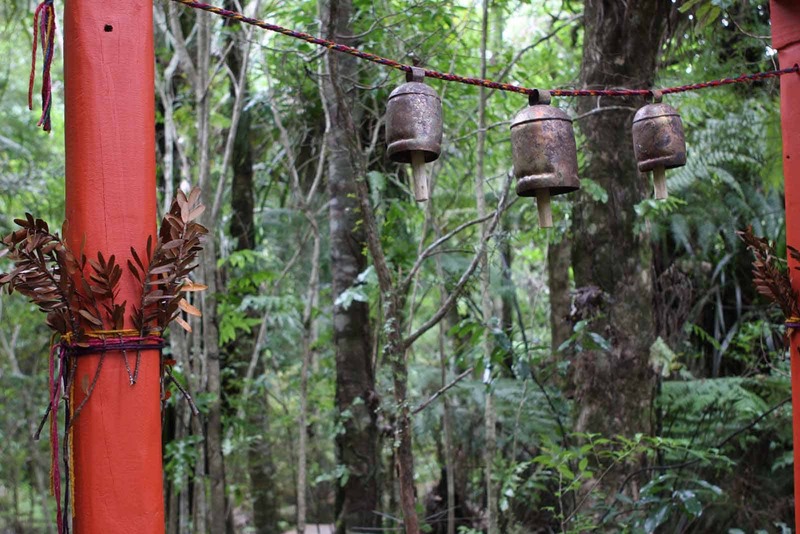 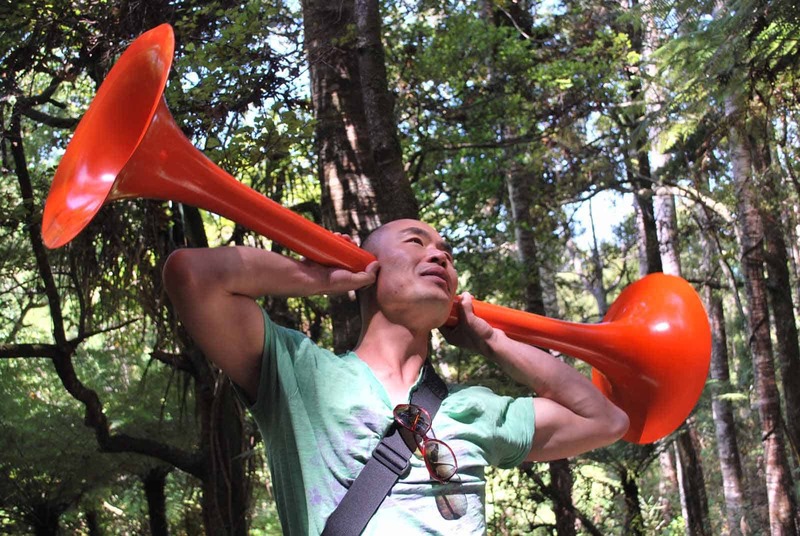 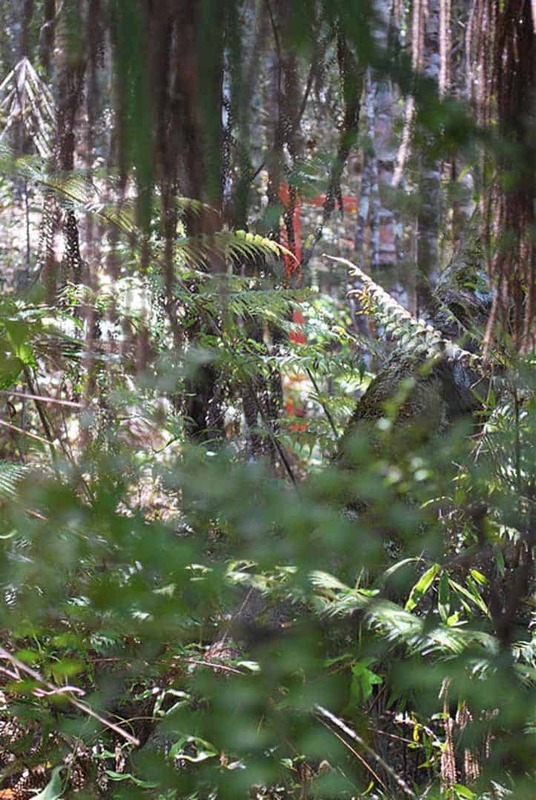 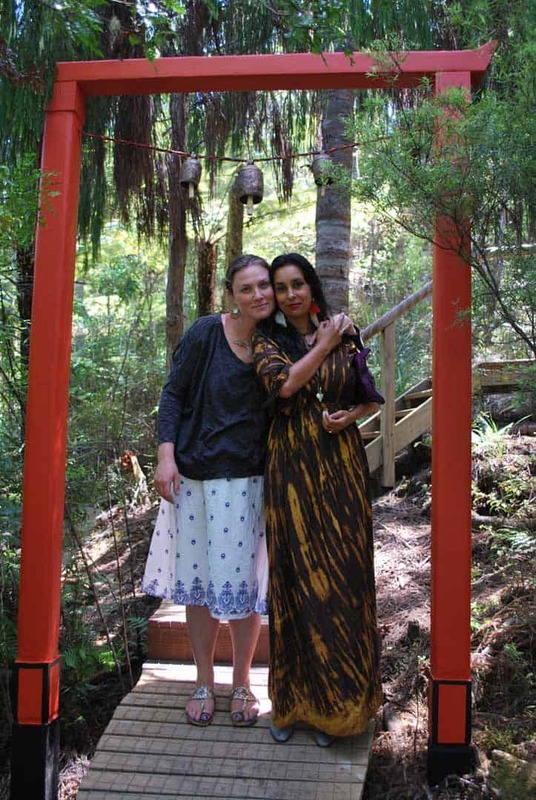 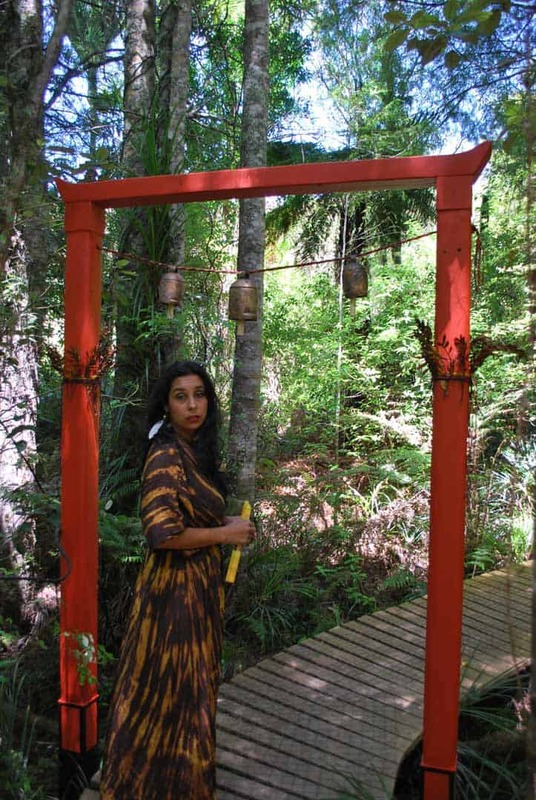 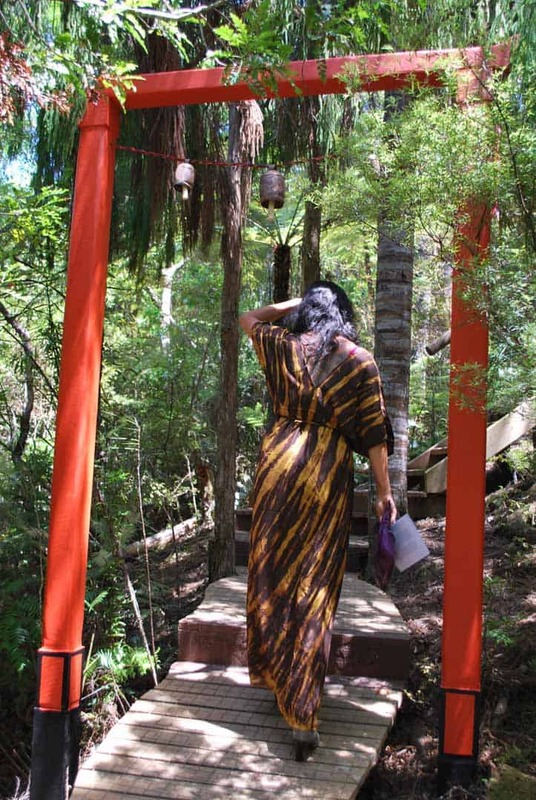 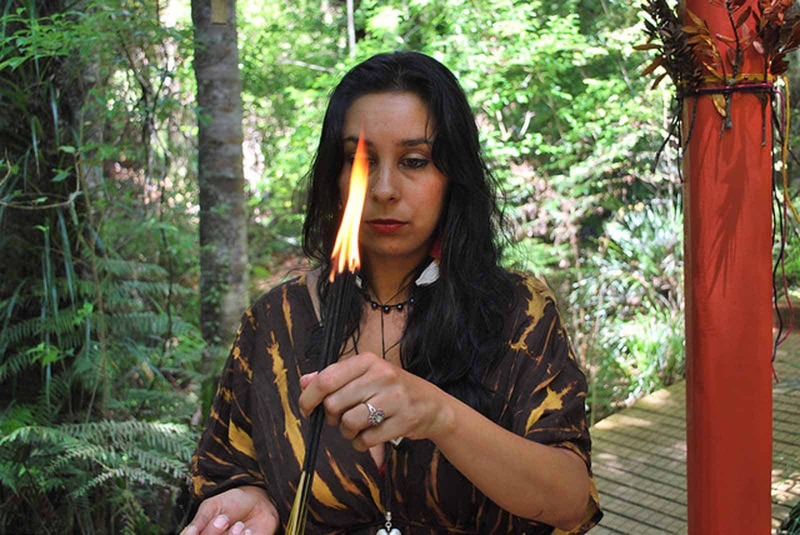 The work is considered an offering to the forest spirits in the hope they will hear our call to keep the kauri safe in the face of the devastating kauri dieback disease that is affecting areas of forest across Auckland and Northland. 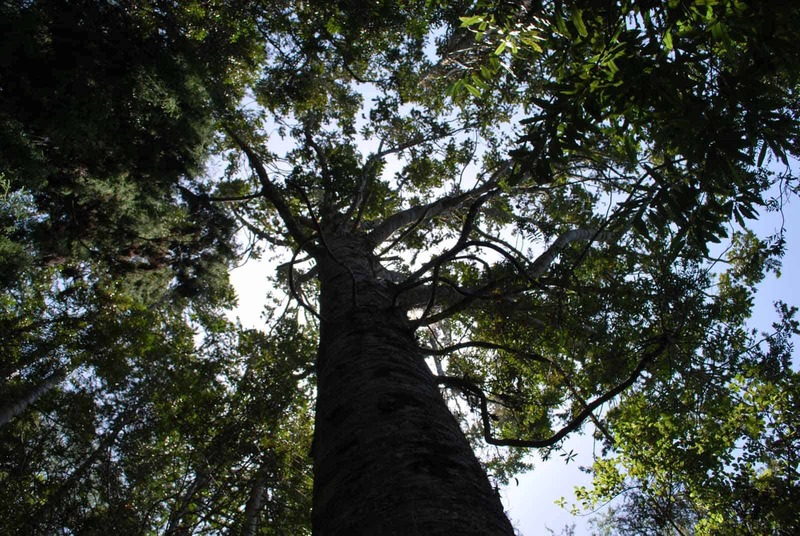 In April 2009, Tāne Mahuta, the largest remaining kauri, thought to be well over 1200 years old, was symbolically partnered with Jomon Sugi on Yakushima island, Japan, one of the oldest Japanese cedar trees, thought to be over 2000 years old. 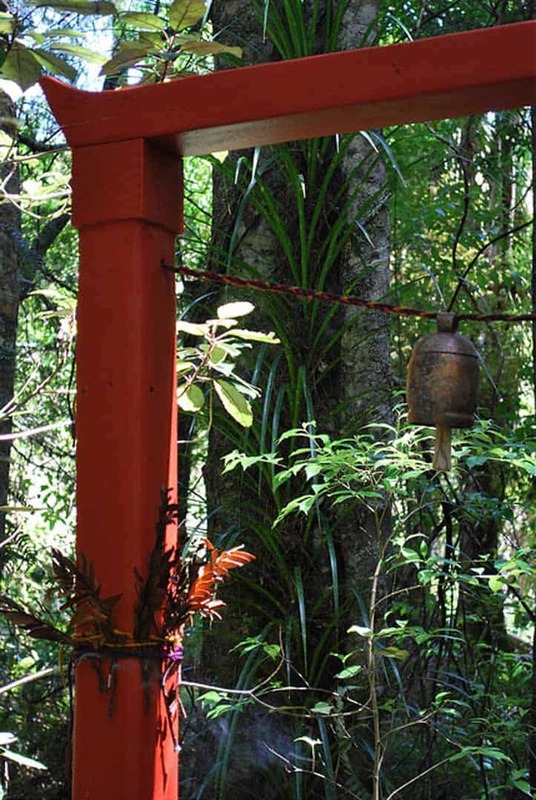 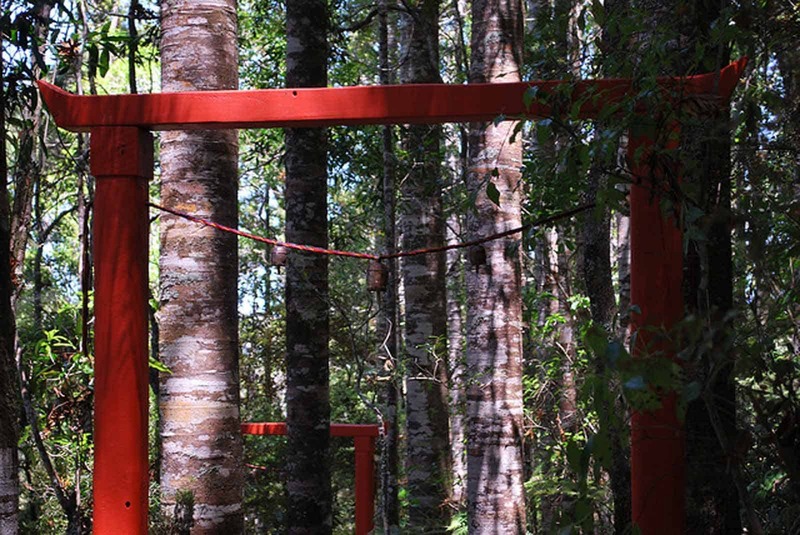 This work references this connection by using the form of Torii gates. 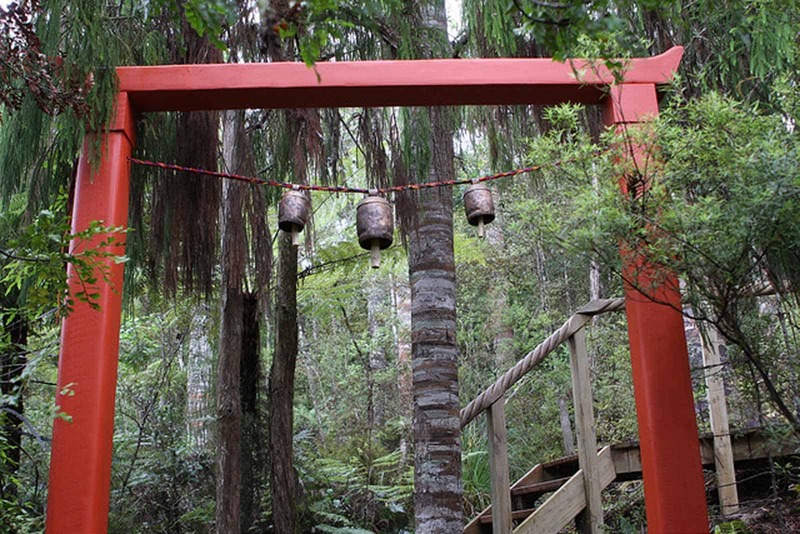 These iconic gates are significant structures, placed at the entrance to shrines, forming the division between our world and the spirit world. 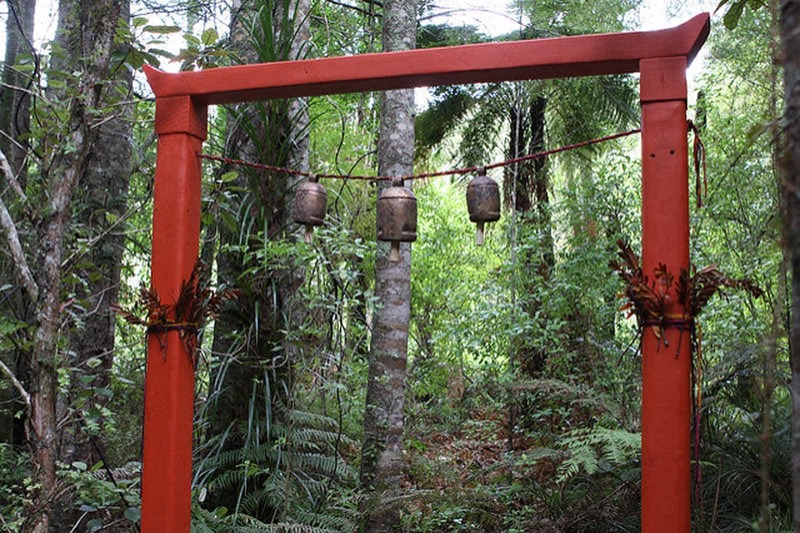 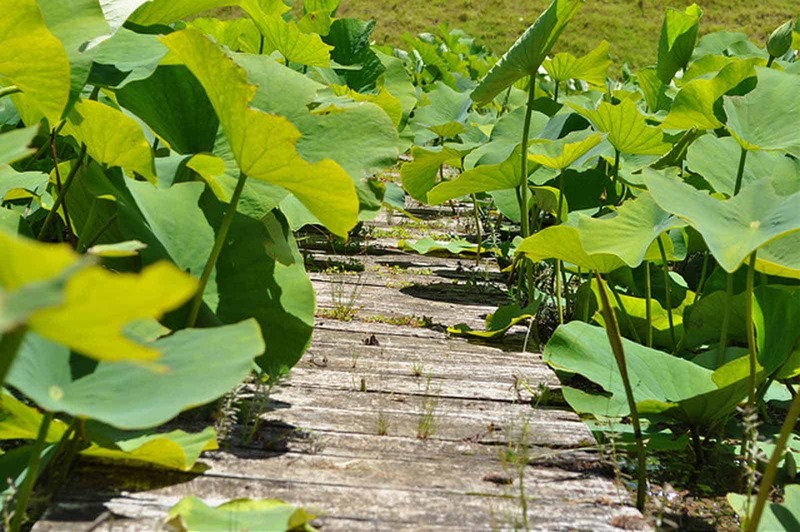 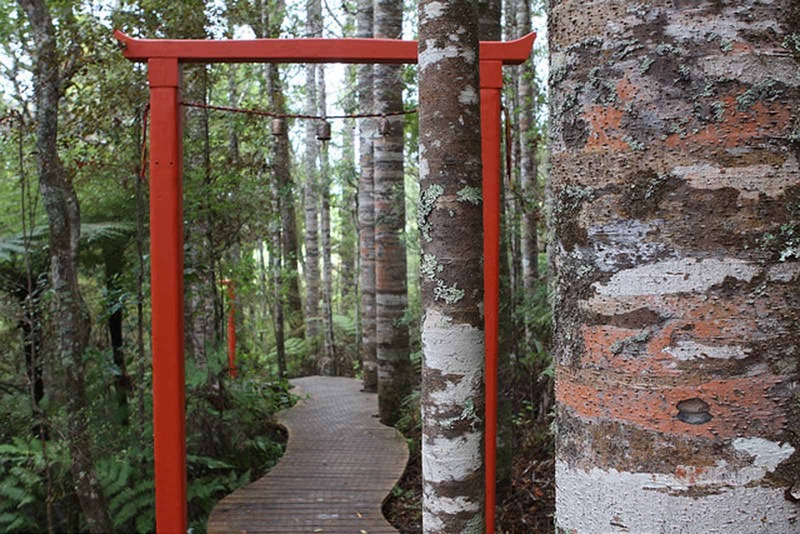 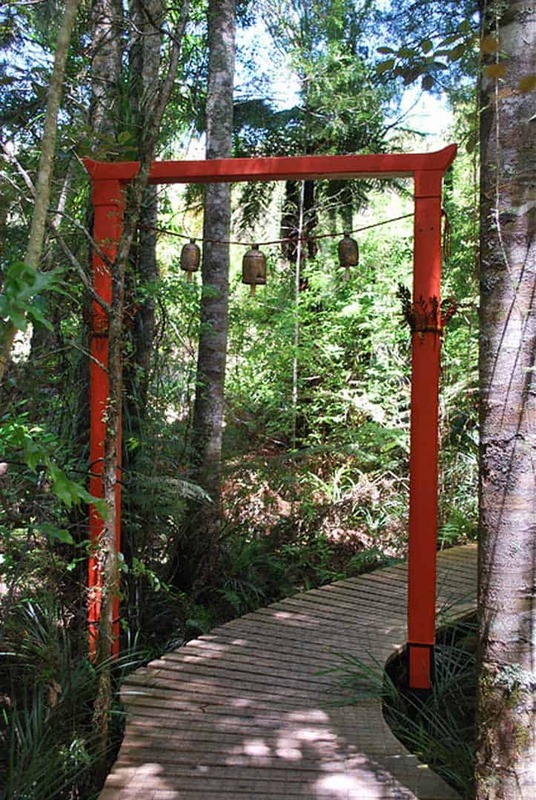 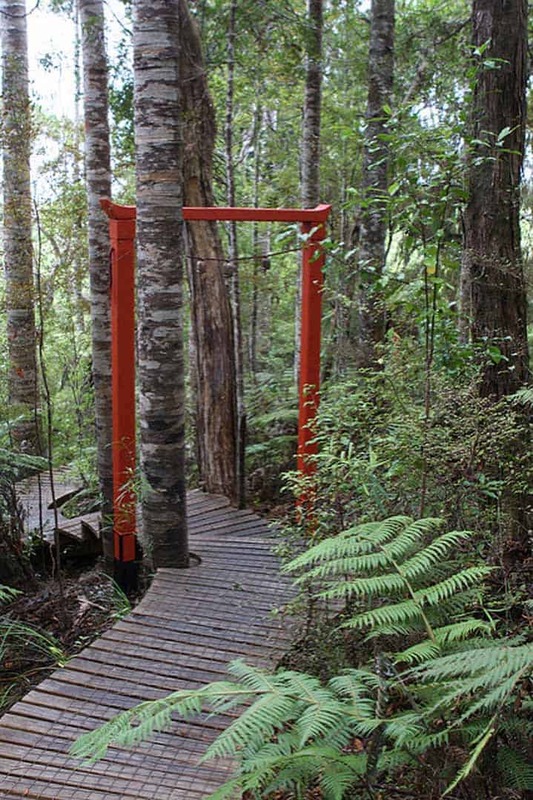 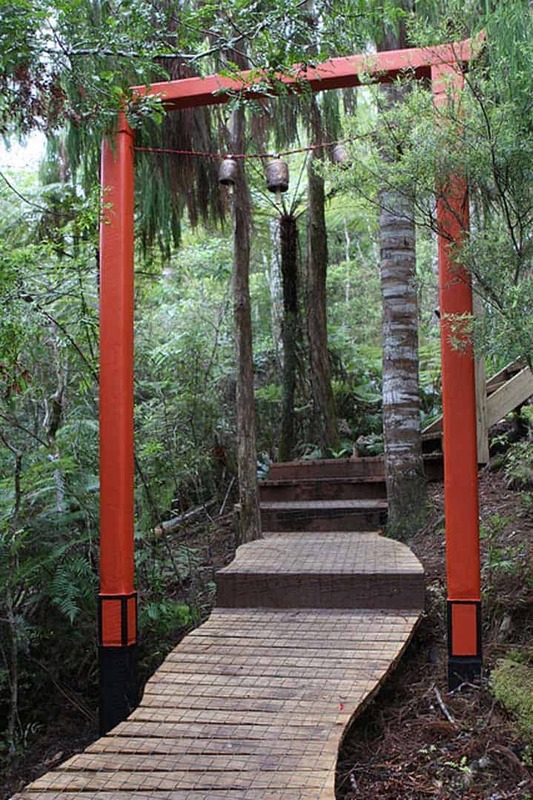 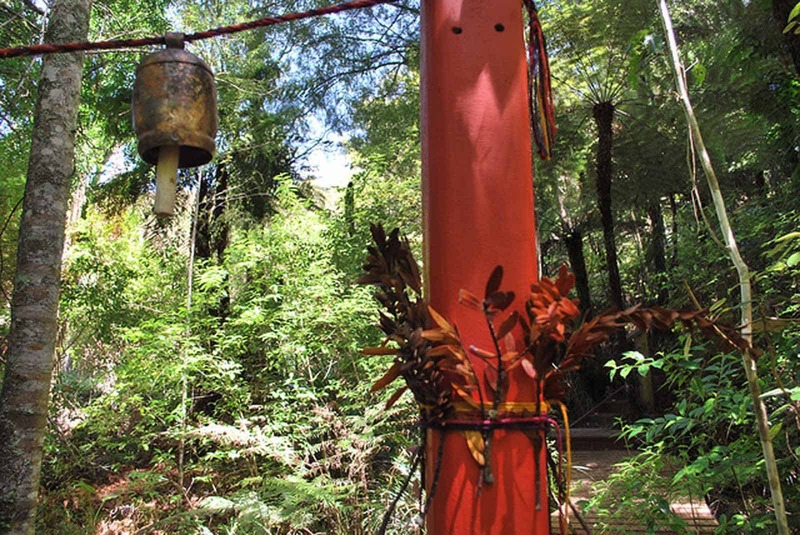 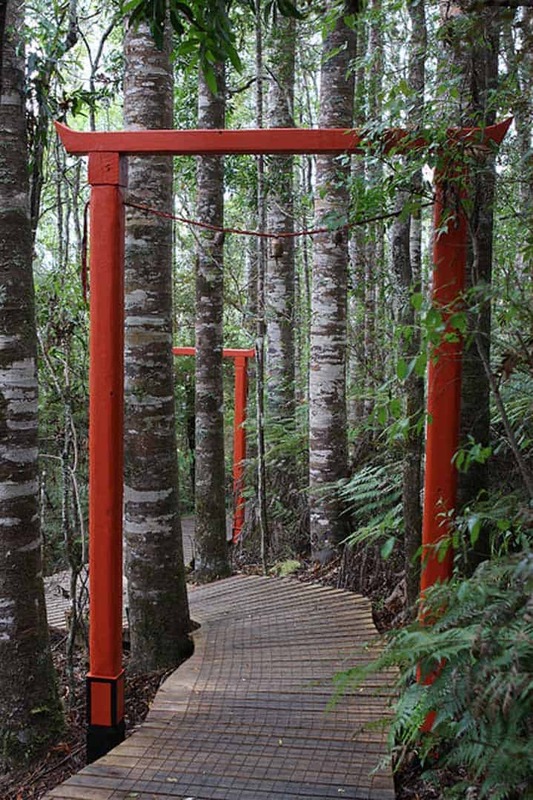 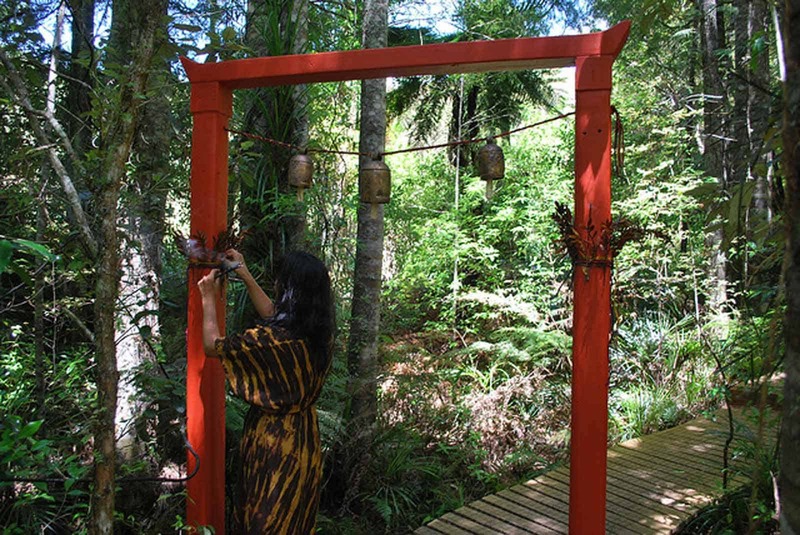 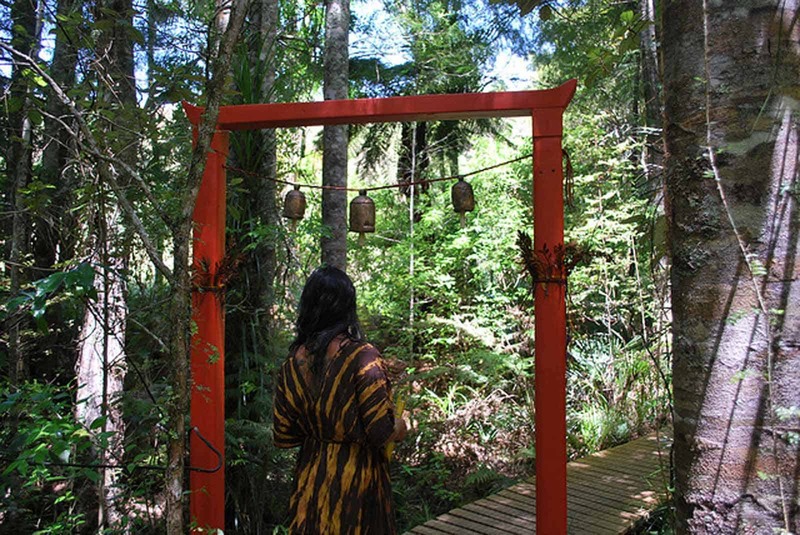 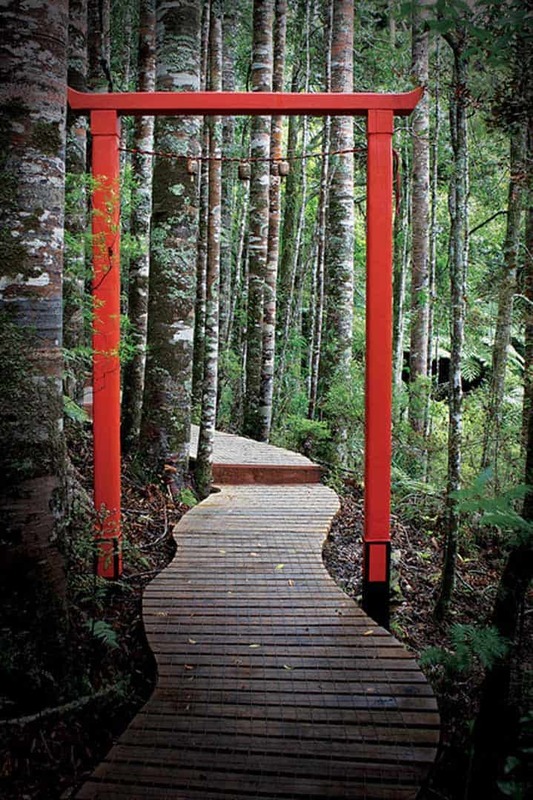 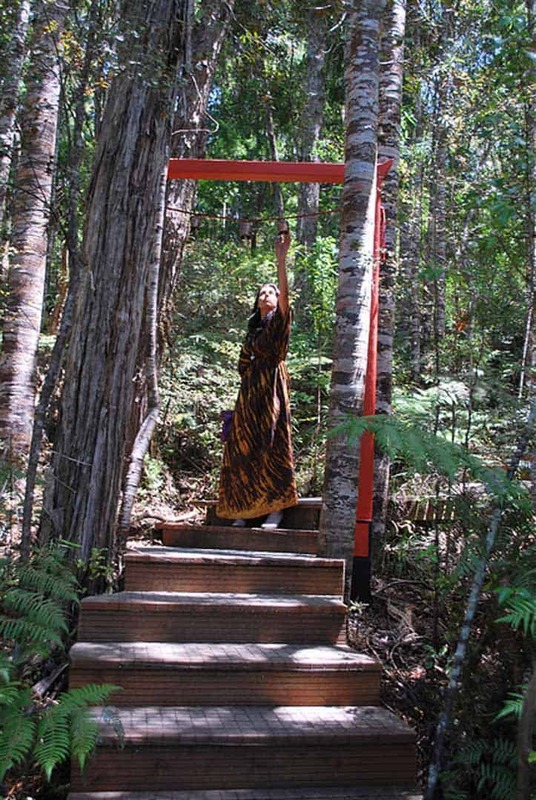 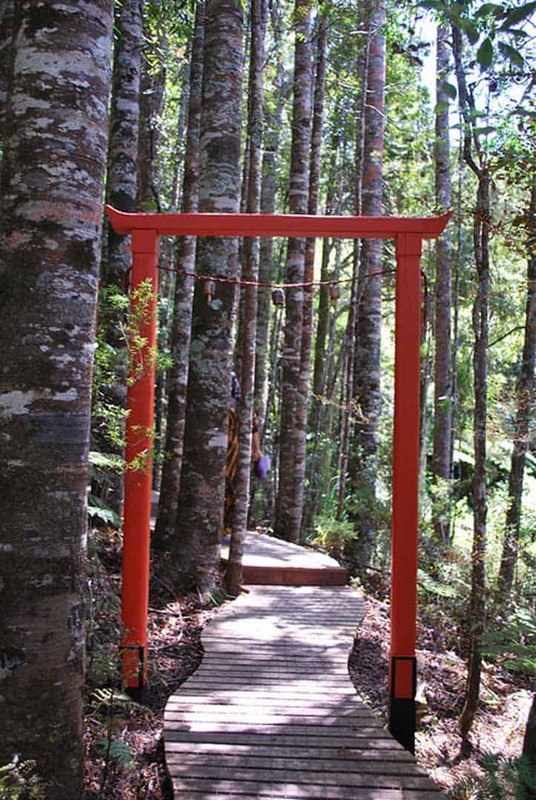 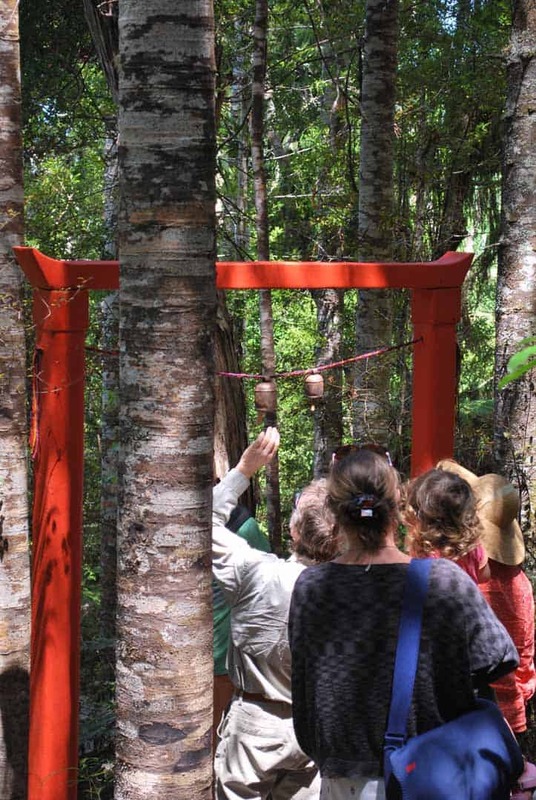 At Brick Bay a series of these gates will lead people along the wooden boardwalk through the kauri grove to the main kauri, which the artist views as living shrines. 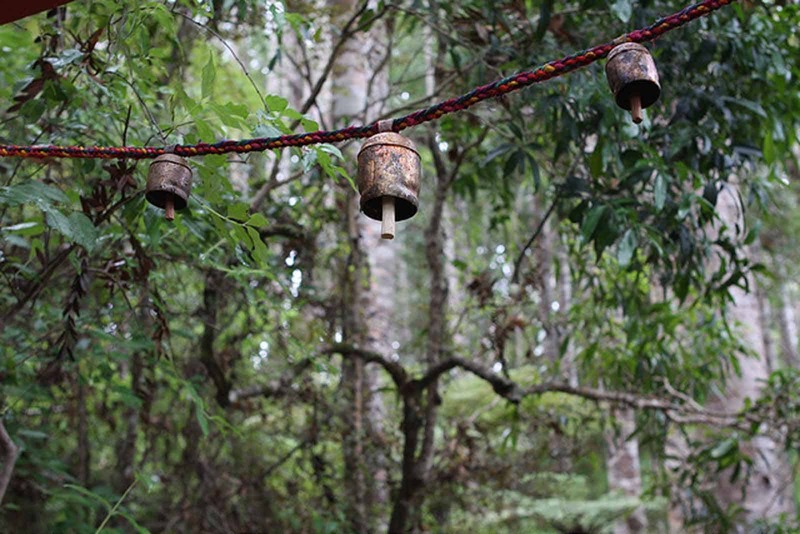 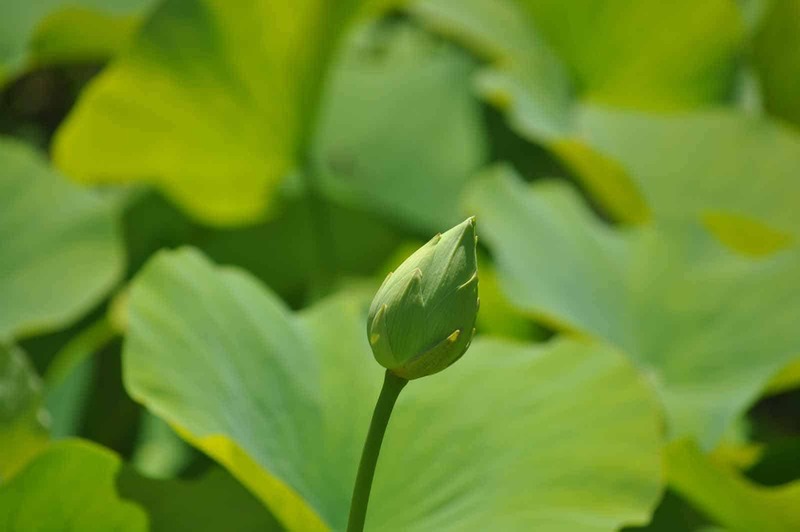 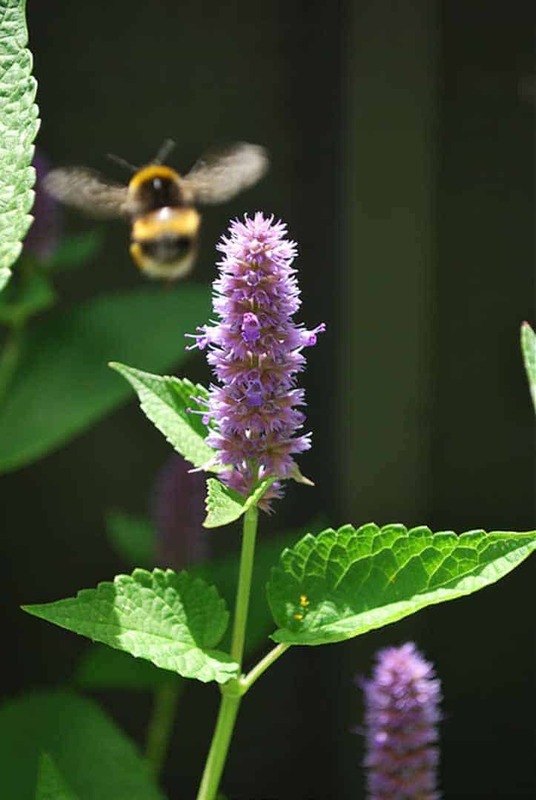 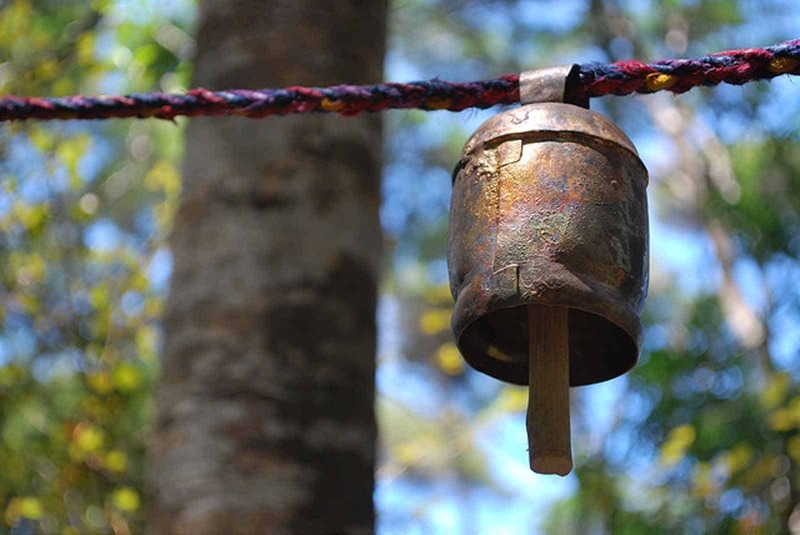 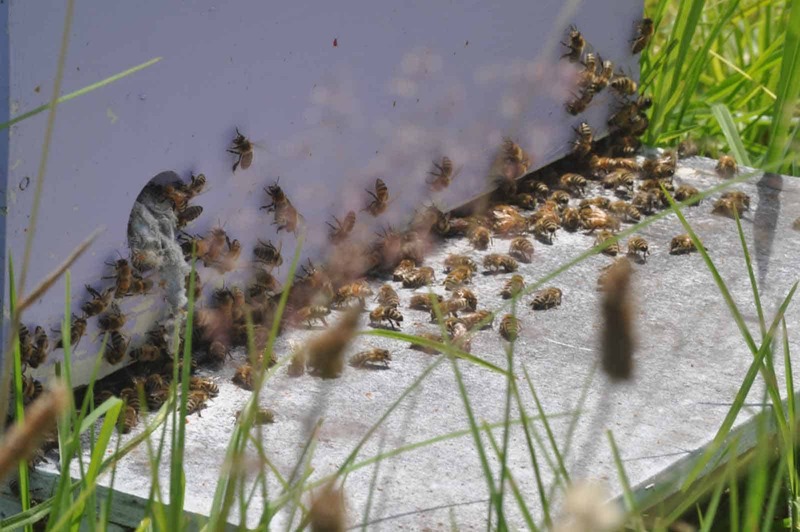 Visitors passing through the gates will be able to play the suspended bells, which become softer and of higher tone as visitors progress along the walk. 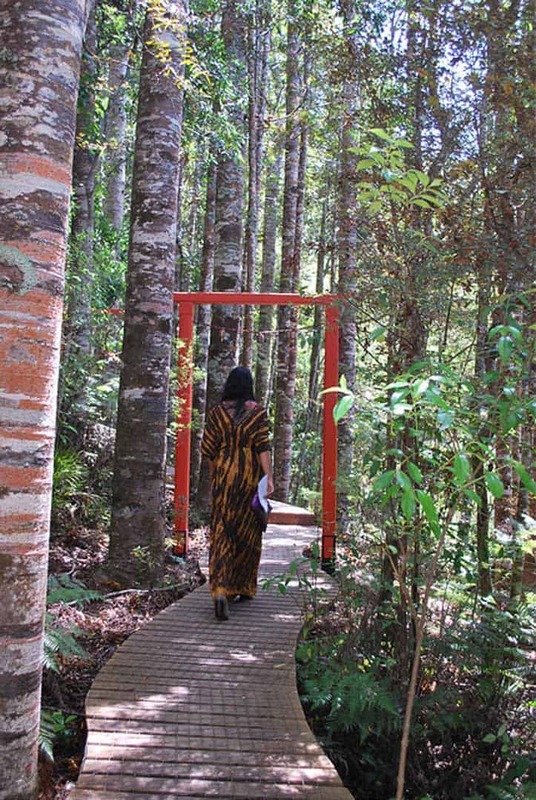 Kauri dieback disease is caused by a microscopic soil-born pathogen and the artist hopes that visitors to the work will be encouraged to learn and carry out the hygiene process necessary to halt the spread of the disease.